Call me crazy....but I spent yesterday after work prepping the many quilt squares needed for me and my cooperating teacher to make classroom quilts with our second graders. I'm using a cotton muslin of which I cut into SIXTY 9"inch squares and then ironed to freezer paper for stability. A quick short-cut: the freezer paper is 18inches wide...so the 9"square blocks fit perfectly upon it and left minimal cutting, that was quick to accomplish. But, never the less, Jackson was beginning to look at me in wonderment of just how long this "train" was going to be! 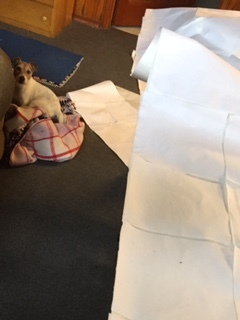 So with the squares now prepped and the fabric markers having arrived, I just need to finish preparing the thematic pictures for the students to trace. (This year we are creating a themed quilt based on our reading units from the year. 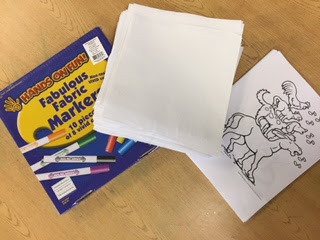 Thus, we will be using preprinted pictures for the students to trace and color onto the fabric.) I hope if any of you want to make a quilt with little ones in your life, this series over the next couple of weeks will give you some inspiration and quick tricks. this is a fun project that makes the extended year fun! Stay tuned as next week the kids begin their creative part. Brilliant! I look forward to following this process and seeing the kid's quilt. It'll be fun to follow. How smart to have such an interesting project to help push through those extra days. I admit, I had forgotten how many days you all missed for snow and I was marveling at your ambition to start this now. Of course, you're smarter than that! Look forward to your progress. What a wonderful project for those students - you put so much into your projects. This will be such a fun project to watch progress. That was a winter to remember! Looking forward to see how this develops on your blog! That is quite the "train" I can see some fun in your future. I can't wait to see how this unfolds! What a fun project. Looking forward to seeing all those pretty colored pictures. I'll be watching this! What are your plans for the quilt when completed? Hanging in the classroom for inspiration? What a great idea for a school year-end project! Are you planning to finish the quilts before the summer break? Whether finished now or over the summer, the finished quilts will make a special backdrop for a welcome-back-to-school celebration event in the Fall. Ooh, maybe even an in-school quilt show!